Destination weddings are so much fun this time of year, especially when the weather turns chilly in many cities, and guests look forward to traveling to a warmer locale. Homemade bath salts make a lovely wedding or bridesmaids favor, especially if your guests will have some down time to relax back in their hotel room. This little gift is easy to assemble and super budget friendly, and you can make it personal by coordinating the packaging with your wedding colors. Mix together the salts in a metal or glass mixing bowl. Sift in the bi-carbonate of soda and stir with a metal spoon to combine. Add your essential oil of choice, and mix salts together thoroughly. At this point you can also add dried flower petals or herbs (such as dried lavender or rose petals). Some people also like to add food coloring, which will result in a colored bath. If using liquid food dyes, just add a few drops until you achieve the desired color. 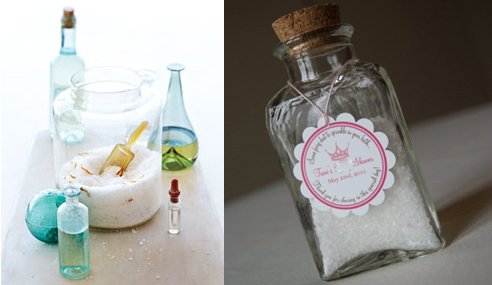 Fill small mason jars with bath salts (left) and decoupage the top with your favorite patterned paper. (Click here for simple decoupage instructions.) Then secure a small wooden scoop to the top using pretty ribbon. Or, fill small lidded jars with salts, and decorate with personalized labels with your name, wedding date and thank you sentiments. Here’s another cute packaging idea….funnel salts in to small glass jars (available at local craft stores or online at Save-On). Hang personalized labels (click here for another label source) from thin string for a delicate look. Bath salts also make a nice addition to hotel welcome gift baskets. Don’t forget to save some for yourself. A relaxing bath the night before your wedding may be just what you need to wake up feeling ready for your big day! I think this is the greatest ideas ever! It is simple and elegant. Plus beautiful and impressive. Thanks for posting pictures! great idea favors for bridesmaids.